﻿ Bill Johnson’s Christology: A New Age Christ? and the Word [Logos] was God. The prologue to the Gospel of John is among the most beautiful passages in all of Scripture. It is also one of the most theologically brilliant. Not only does John assert that the Logos was WITH God in the creation account of Genesis by paralleling the first few verses with those that begin the canon of Scripture, John states the Logos WAS God. He is illustrating the plurality of the Godhead, i.e. that God is monotheistic yet more than one ‘Person’ (John would describe the Person of the Holy Spirit later in 14:15-16:15). The Gospel writer makes it clear that God the Word/Logos became flesh, yet He was fully God in the flesh and not ‘merely’ human. However, other groups claimed that John had different thoughts in mind for the Logos. Some Gnostics in the 2nd century (and later) claimed John’s Gospel has a dualistic Gnostic backdrop with his contrasts of light and darkness (v 1:5) and other dichotomies, and they interpreted John’s Christology as congruent with Gnostic redeemer myths117 (redemption through autosoterism, or self-salvation). Some have claimed Hellenistic (ancient Greek) influence. According to NT scholar Craig Keener, Heraclitus, a Greek philosopher of the 6th century BC, “reportedly spoke of ‘Thought’ as guiding and ordering the universe” and his work refers to the Logos as being “eternal, omnipresent, the divine cause”.118 The Stoics took this further as Zeno “identified Socrates’ logos, or rational principle, with that of Heraclitus” calling this “the common law” or “natural law”.119 Apparently, these groups believed the Logos was present in all of creation, i.e. they had a panentheistic (God is in all) worldview. It seems quite plausible that the Gospel writer, being well aware of current philosophical and religious thought, wrote the prologue and parts of the rest of the Gospel with a dual purpose – as both a Gospel and an apologetic against these threats. This is especially possible if one assumes a late date of authorship as do most scholars (between 90AD and 100AD).125 In fact, Irenaeus, in his Adversus Haereses (Against Heresies), circa 180AD, makes the claim that the Gospel of John is an apologetic against the burgeoning Gnostic (or proto-Gnostic) threat of John’s day.126 John’s Gospel (and, of course, his epistles, especially 1 John which contains elements of the Gospel’s prologue) can function as an apologetic against current Christological heresies as well since some of the concepts above are being perpetuated in slightly different forms today. What does he mean by “the Word becoming flesh in us again”? Are we to be just like Jesus, i.e. divine? Or was Jesus not the second person the Trinity made flesh in the first place? Is this what Johnson means by “Jesus emptied Himself of divinity and became man”?128 Perhaps this is speaking of the false parousia as mentioned in part II? Or, is this a combination of some or all of these? Please note that the Scripture in Matthew 13 [13:21-22] refers to the Gospel message, not the “rhema” Word as Johnson would have us believe. Scripturally, either one accepts the Gospel message and stays true to the Faith (the true convert) or one drifts away when trials and tribulations arise, when persecution comes, or the message is choked out by the concerns of life (the false convert). The Christ is son, the only son begotten by Almighty God, the God of Force and God omniscient, the God of thought; and Christ is God, the God of Love. …Through Christ all life was manifest; and so through him all things were done, and naught was done in forming worlds or peopling worlds without the Christ. Overall, Johnson appears to be making the point that to be strong, to grow in the faith, one must become more and more attuned to the ‘continuing revelation’ of the “rhema” word. This is instead of the Christian orthodox view of sanctification by submitting to the Holy Spirit’s leading rather than our own flesh, carnality. Biblically, the parable of the wheat and the tares/weeds [Matt 13:24-30] is about true Christians and false Christians. The false Christians (tares/weeds) will be intertwined with the true (wheat) until the eschaton, the consummation, the end of all things. …Jesus likened the kingdom to a seed because a seed has unexpressed capacities, and needs to be planted in the soil best suited, and when planted in a receptive mind it brings forth the fruits of the Spirit. The life of the word is the spiritual idea it contains. The kingdom of heaven is attained, first, by one’s establishing in one’s mind the consciousness of the truth of Being; second, by one’s outer life to Truth. Jesus used many commonplace things to illustrate the establishing of the kingdom of heaven in consciousness in order that we might the more easily adjust all our thoughts and acts in harmony with the ideas that make heaven. Dowling’s point is that Jesus of Nazareth so demonstrated His worthiness to become ‘the Christ’, the World Teacher of the Piscean Age, that He was fully possessed by ‘the Christ’, the member of the false Trinity. That is, Jesus, like all others, had the seed within Him (‘Christ within’, the “Thoughts of God” which pervade “all spaces of infinity”) which was then activated by ‘the Christ’, the Son of the false Trinitarian Father, who eventually “took full possession” of Him. Once ‘the Christ’, the Logos of Infinities, the false Trinitarian Christ, took full possession of Jesus of Nazareth, Jesus then became ‘the Word made flesh’. The now ascended Master Jesus, the “World Teacher” for the Age of Pisces, is now our example to follow towards our own ascension to godhood. To that end, we ourselves must also become “the Word made flesh”. Given the earlier comparison (in part IIIa) of some Christological quotes of Bill Johnson to those of Levi and the comparisons in this particular section, it is entirely plausible that Johnson intends the same meaning as Levi with respect to “the Word made flesh”. Interestingly, later in the “Jesus is our Model” sermon, Johnson comes close to correctly explaining Jesus’ first temptation as Him not succumbing to the Devil’s temptation to turn stone into bread: “He could have used the anointing that the Father had given Him through the Holy Spirit to turn the stone into bread. But, He would not prostitute the favor, the anointing, the power, for personal gain…He faced it; He quoted Scripture; He brought the Word back into focus.”148 However, note that He refrained from using “the anointing that the Father had given Him” rather than His own inherent divinity. So, initially, Johnson goes to great lengths to show that Jesus’ first temptation was to question who He was as the “rhema” Word made flesh; yet, he later claims that Jesus first temptation was to get Him to use the power of ‘the anointing’ “for personal gain” thereby contradicting his first interpretation. However, he asserts once again that Jesus’ first temptation was to “question His identity” near the very end of this sermon.150 This aptly illustrates Johnson’s duplicity. …So Jesus makes this declaration: “My words to you are spirit and they are life…Jesus is the Word of God made flesh; but, every time He spoke, the Word of God became Spirit – Word made flesh; Word made Spirit… Why is that important? Is this Levi’s (God of) Force ‘made manifest’ “through the Word”? The similarities are striking indeed. Later in this same monologue, Johnson tells the audience the entire purpose of “all ministry” which is to literally “impart the Person of the Spirit of Christ”. Which “Spirit of Christ” is being imparted? Is this the method Johnson has in mind “to impart Presence through speech”? Is this what is meant by his conviction that the ultimate goal of ministry is “actually imparting the Person of the Spirit of Christ into the atmosphere, into a situation”? While Johnson does not make any explicit or implicit claims of omniscience in believers with his words above, he implies it in the following section (while Bob Jones does so explicitly). The Living Word or Bread of life once again desires to be made flesh through a body of people joined with Him in a holy consummation. As we live not by natural bread alone but by the living Word proceeding from the mouth of God, the bread of abundant life, even so the hidden truth of godliness will become part of our spiritual DNA. Since Jesus identified Himself as the “Bread of Life” [John 6:35, 48], it is clear Jones is claiming that some believers will, at some point, be just like Jesus as “the Word made flesh”, thus mirroring Johnson above. Apparently, in living by the “living Word proceeding from the mouth of God” the spiritual DNA is expanded. In part II it was shown how Bob Jones differentiated between the physical body which contains our DNA as compared to “His [God’s] genetics” / conscience / spirit within each person that has “authority over DNA”. This is subsequently added to the human body (clay). Jones’ teaching appears to be a ‘Christianized’ version of the esoteric/occult doctrine of reincarnation. This presumably occurs when one taps into “the Wisdom of the Ages” [see part II and below]. It is entirely possible, if not probable, that Jones has in mind ‘the Christ’ which is part of the false Trinity of Levi, i.e. the one which “took full possession” of Jesus of Nazareth (or a similar teaching). This then would mean that when Jones speaks of ‘Christ’ “coming IN my people” [see part II] – referencing the false parousia – he’s referring to this same false Christ. Jones is reiterating that it’s the spirit which is “as mature as it will ever be” which was “put in here [the body]” at conception. It seems Jones’ “God sperm seed” is the agent which activates “His [God’s] genetics”, “your conscience”, which allows one to “tap into the Wisdom of the Ages”. This “God sperm seed” is apparently what activates the “spiritual DNA” which “has authority over DNA”. This appears to be very similar to, if not the same as, Johnson’s teaching on the “sperma of God”. Johnson’s point is essentially that other concerns “choke out” the ‘rhema Word’ preventing the “seed of God’s Word”, which is the “sperma of God”, from growing in the soil of the human. With this teaching, he may well be promoting, in a more subtle way, the same doctrine of reincarnation that Jones has explained a bit more explicitly in part II. The following quotes will help explain this a bit more. …Exposure to the supernatural works of God changes the capacity of leaders to lead, thereby changing the bent of the people of God to pursue Him. It is said that when a kernel of corn is planted, every kernel that grows has the exact same DNA as the original kernel in the ground. Jesus became the ultimate seed that was planted in death, and we were born again by the same Spirit that raised Him from the dead. Every born-again believer has the DNA of Christ. That is amazing! In this context, ‘born again’ refers to the point at which the ‘spiritual DNA’ is activated. Once again, Johnson stresses how Jesus was raised by the Spirit rather than by the Father AND Christ Himself as per orthodoxy. And this same ‘Spirit’ provides the ‘born again’ experience of every ‘believer’. Johnson stresses this elsewhere in the same book: “The Holy Spirit in us is the same Holy Spirit who raised Jesus from the dead. He is the Spirit of the resurrected Christ.”176 Johnson emphasizes ‘the Spirit’. Could Johnson be referring to the same “Christ Spirit” that Benjamin Crème had in mind as indicated at the end of part IIIa? This “resurrection power” described above was discussed in Bill Johnson’s ‘Born Again’ Jesus, Part II illustrating likely roots in MSoG teaching which has a parallel teaching in the occult / New Age / New Spirituality which itself is predicated on the false doctrine of reincarnation. It is clear that growth cannot be accurately measured by the number of doctrines we learn or the amount of knowledge we achieve. Spiritual growth is measured by the spiritual life we have received from Him. This is the Zoe Life that IS Christ in us. This is the Life that comes into us as the sperma of God when we are born again. This “sperma” is the living and abiding word of God. It is also called the Spirit of Christ or the Spirit of His Son. The same “sperma” that was impregnated into Mary to develop into the Man Christ Jesus also comes into us. The growth of that “sperma” was the incarnation of God in a human body. God’s goal for the church is the incarnation of Christ IN His body now on earth. For that reason God begins by infusing the “sperma” of God which is the living and abiding Word of God into each of us individually. Then individual “members” are assembled into a local body called the church. The corporate church is said to be the fullness of Him that fills all in all. In other words this church is the manifestation of Christ. This looks a LOT like Bill Johnson’s teachings. Not surprisingly, Eternal Vision asserts that Jesus was formed from the same “sperma” that ‘infuses’ “each of us individually”. This correlates to Johnson’s teaching of Jesus as explained above regarding Jesus as the “rhema” Word made flesh by this “living and abiding word” indwelling Jesus rather than Jesus as the second Person of the Trinity made flesh via the hypostatic union. Of course, this also correlates with the teaching of Levi above. Certainly, everything that we are physically is encoded in the DNA. We have physical DNA in our cells, and spiritual DNA that is in our energy field. These two energies have to be connected, just as the left and right hemispheres of the brain must become integrated and balanced as we move into the Fifth Dimension. …[C]an we fathom the untold significance of having our Father’s DNA? I no longer merely confess that I am the righteousness of Christ. I realize that with His DNA in me through His blood, I could be nothing else. I realize the attributes of His DNA reside in me—whether dormant or active. In our current DNA structure, we have two visible strands, which are called backbone DNA, but all the other 10 other strands are present…According to Esoteric teachings, the first two strands are Physical DNA, the other ten strands are Spiritual DNA. Do we have a divine nature? Scripture shows we have a fallen, sinful human nature but never does the Bible say or even allude to humans having a divine nature. Yes, the Holy Spirit is in the true believer which makes us “partakers of the divine nature” [2nd Peter 1:4 NKJV] but only through Him. The word partake does not mean become. Yes, we can say “Christ in us, the hope of glory” [Col 1:27]; but, this does not mean we become Christ or divine. Only the Trinitarian Godhead is divine. However, as explained earlier, esoteric/occult teaching is such that man has a dual nature – one human and one inherent but latent divine nature which must be actualized through self-effort. Once an individual acknowledges their inherent divinity, then they can work towards actualizing it. This seems like the best explanation for Bill Johnson’s concepts of the “sperma of God”, “Word made flesh”, “spiritual DNA” and the other material brought forth in this article. ‘We are partakers of his divine nature.’ 97% of our DNA is unused, not active; therefore, the science communities don’t understand it. I believe that the discovery of DNA at the time it was discovered was carefully orchestrated by God in man…. …The 97% of your DNA that’s not activated is GOD waiting to be activated in man. You have the information and intelligence of the Adam the son of God encoded in your DNA. Access and activation to this information will cause you to live as Adam the God-man in the Garden of your Be-ing…. John Lewis’ teachings sure do resemble those of Johnson, Jones, Ahn and Bentley, do they not? Part IV will discuss how some other teachings of Johnson resemble those of occult / New Age / New Spirituality and will conclude this series. 117Rudolph, Kurt; trans. R McLachlan Wilson Gnosis: The Nature & History of Gnosticism. © 1977 Koehler & Amelang; translation (from German) of second, revised and expanded version © 1984 T&T Clark Ltd, Edinburgh; 1987 (1st paperback), HarperCollins, New York, NY; pp 159-160, 305-306. Craig Keener, in his commentary on John [The Gospel of John: A Commentary, Volume One. 2003, 1st Softcover Ed, 2010, Hendrickson, Peabody, MA; pp 339-363], exhaustively covers the various possibilities for the Gospel writer’s reason for using the term Logos. Keener contends that any Gnostic influence on the Gospel writer is “not probable” [p 340]. 122Keener; pp 347-363. While Keener is convinced of the parallel, Andreas Kostenberger [Kostenberger, Andreas J. Encountering John: The Gospel in Historical, Literary, and Theological Perspective (Encountering Biblical Series). July 2009 (8th prtg (paperback), (1999)), Baker, Grand Rapids, MI; pp 52-57] is less so as he sees “Wisdom” as a divine attribute instead [p 53]. Kostenberger believes the parallel is not close enough and, “if no closer parallel can be found, it may be necessary to conclude that personified Wisdom constitutes at least a remote parallel to the characterization in John” [p 53]. 125Keener; pp 140-142. Keener notes that “John’s literary freedom” [p 140] makes it easier to date the Gospel. 127“whizzpopping” YouTube video, Bill Johnson – Friendship with God. Uploaded November 1, 2009 , taken from Bethel Church in Redding, CA, <http://www.ibethel.tv/watch/399/open-heavens-conference/2009/10/14?session=113> Open Heavens Conference October 15, 2009, morning session, Bill Johnson <http://www.youtube.com/watch?v=P4RZ_ctiwlE>; 1:24 – 1:37; as accessed 04/23/12. Caps from emphasis in original; other emphasis added. 128Johnson, Clark, The Essential Guide to Healing; p 75. Emphasis added. 129“ewenhuffman” Jesus is our Model- Sermon of the week 20 Dec 09. Posted December 23, 2009, “Bill Johnson sermons for downloading”, mp3 audio, taken from <http://www.ibethel.org/> December 20, 2009, original sermon titled “Jesus is Our Model” <http://ewenhuffman.podbean.com/2009/12/23/jesus-is-our-model-sermon-of-the-week-20-dec-09/> 24:07 – 24:24 (Johnson continues reiterating this thought until 24:57 at which he point he explains this via Matthew 13); as accessed 04/21/12. Emphasis added. 131“ewenhuffman” 24:57 – 25:17. Emphasis added. 132“ewenhuffman” 25:17 – 26:18. Caps from emphasis in original; other emphasis added. 137“ewenhuffman” 26:19 – 27:11. Caps from emphasis in original; other emphasis added. 139“ewenhuffman” 29:11 – 29:28. Emphasis added. 143Unity School of Christianity Metaphysical Bible Dictionary. 1931 (1955, 8th pr. ), Unity School of Christianity (no publisher specified), Lee’s Summit, MO; p 388. Emphasis added. 148“ewenhuffman” 30:21 – 31:01. Importantly, Johnson indicates Jesus refrains from using the power of “the anointing” as opposed to stating Jesus refrained from using His inherent divinity which would be the predominate historical orthodox view. 152“ChasingRiver”; 12:14 – 12:39. Emphasis added. 153“ChasingRiver”; 13:09 – 15:08. Emphasis added. 154“ChasingRiver”; 34:40 – 35:08. Emphasis added. 158Bailey, Telepathy; p 6. Emphasis added. 161Bailey, Alice A. Initiation, Human and Solar. © 1951 Lucis, NY, 4th paperback ed, 1980 (First printing 1922), Fort Orange Press, Albany, NY; p 67. Emphasis in original. 167Jones, Bob & Paul Keith Davis Shepherd’s Rod 2005. © 2002 Bob Jones and Paul Keith Davis, Bynum Printing, Waynesboro, MS; pp 15-16. These “Shepherd’s Rods” are purportedly ‘prophetic words’ Jones receives each year on Yom Kippur, the Jewish Day of Atonement. What is the significance of Yom Kippur as the Day of Atonement to the Christian when Jesus’ blood sacrifice IS the Day of Atonement and the fulfillment of this Jewish holy day? The year of Jones’ “Shepherd’s Rods” is always the year following Yom Kippur, in this case the actual date was September 25, 2004 (from page 1 of the booklet). Paul Keith Davis is of White Dove Ministries. 168Jones, “Coming Kingdom”; 5:02 – 5:11. Emphasis added. 169Jones, “Coming Kingdom”; 10:53 – 11:59. Emphasis added. 170Jones, “Coming Kingdom”; 24:48 – 25:30. Emphasis added. 171Jones, “Coming Kingdom”; 26:19 – 26:38. Emphasis added. 172Johnson, Heaven Invades; p 81. Emphasis added. 173Johnson, Heaven Invades; p 25. Emphasis added. 174Johnson, Release Power of Jesus; p 140. Emphasis added. 175Johnson, Clark, Essential Guide to Healing; p 147. Bold from emphasis in original; underscore added. 176Johnson, Clark, Essential Guide to Healing; p 135. Emphasis in original. 177Johnson, Bill, “Super-Natural by Nature” Charisma. June 09, 2011, online version <http://www.charismamag.com/index.php/component/content/article/1571-features/31221-super-natural-by-nature> par 13. As accessed 4/26/12. 178Eternal Vision Ministries, home page <http://www.eternalvisionministries.com>. As accessed 4/27/12. 179Eternal Vision Ministries “The Function of the Bride”, <http://www.eternalvisionministries.com/_writings/writings/10022_bride_function.html> par 4-6. Emphasis added. As accessed 4/27/12. 180“The Spirit of Ma’at” website by Asa Wulfe “Creating Heaven on Earth with Jean Adrienne”, Vol 4, No 5, n.d. <http://www.spiritofmaat.com/archive/dec4/adrienne.htm> par 13. As accessed 4/27/12. 181Wulfe; par 14-17. Emphasis added. As accessed 4/27/12. 182Ahn, Che “Spiritual DNA” Column: First Priority, Ministry Today; June 30, 2007, online version <http://ministrytodaymag.com/index.php/first-priority/15390-spiritual-dna>; par 4-8. Emphasis added. 183Humanity Healing Network website, ‘hhteam’, “Spiritual DNA”, <http://humanityhealing.net/2010/08/spiritual-dna/>; par 6-7, 15. Emphasis added. As accessed 4/27/12. 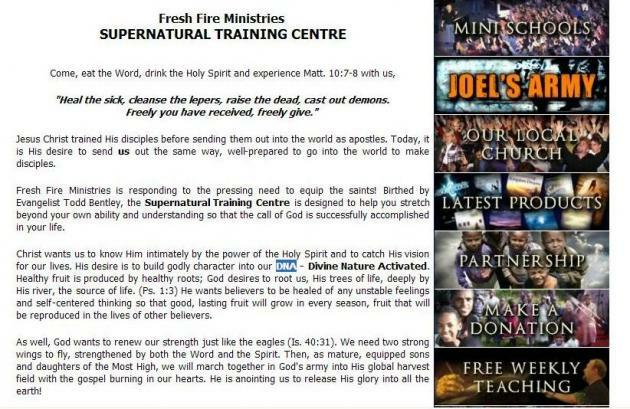 184Fresh Fire Canada website, Todd Bentley, “Supernatural Training Center” courtesy Internet Archive (the Wayback Machine),<http://web.archive.org/web/20070826155456/www.freshfire.ca/index.php?Id=4&pid=994>; par 3. Emphasis in original. As accessed 4/27/12. 186Age to Age Ministries, John Lewis, “DNA 2002: Divine Nature Activated” <http://www.atam.org/DNA.html>; par 1-2. Emphasis added. As accessed 4/27/12. © 2012 Craig - CrossWise Blog. All rights reserved. This copy is cpyrighted to the Birthpangs Website: http://www.birthpangs.org/ This document is the property of its author and is not to be displayed on other websites, redistributed, sold, reprinted, or reproduced in printed in any other format without permission. Websites may link to this article, if they provide proper title and author information. One copy may be downloaded, stored and/or printed for personal research. .